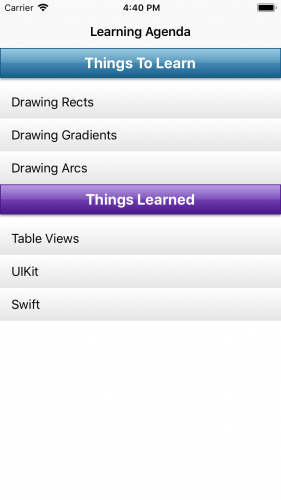 Update note: Lorenzo Boaro updated this tutorial for iOS 12, Xcode 10 and Swift 4.2. Ray Wenderlich wrote the original. Welcome back to another tutorial in our Core Graphics tutorial series! This series covers how to get started with Core Graphics. Core Graphics is a two-dimensional drawing engine with path-based drawing that helps you to create rich UIs. In this tutorial, you’ll learn how to draw arcs and paths. In particular, you’ll enhance each footer of a grouped table view by adding a neat arc on the bottom, a linear gradient and a shadow that fits the curve of the arc. All of that by using the power of Core Graphics! 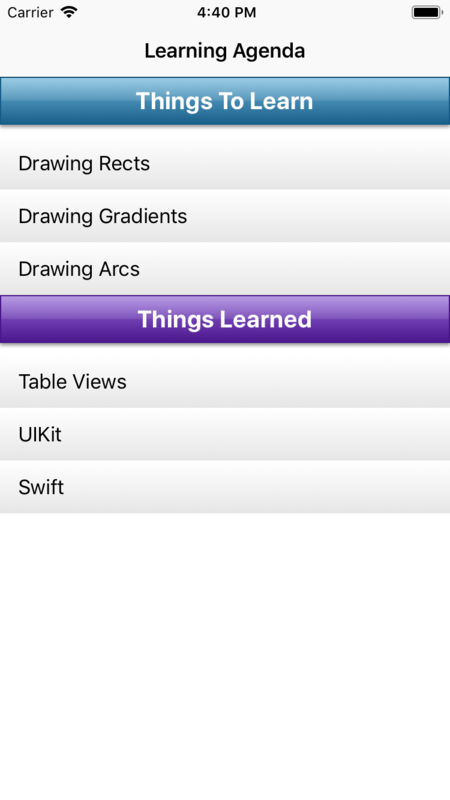 For this tutorial, you’ll use LearningAgenda, an iOS app that lists the tutorials you want to learn and the ones you’ve already learned. Start by downloading the starter project using the Download Materials button at the top or bottom of this tutorial. Once downloaded, open LearningAgenda.xcodeproj in Xcode. To keep you focused, the starter project has everything unrelated to arcs and paths already set up for you. As you can see, there is a grouped table consisting of two sections, each with a title and three rows. All the work you’re going to do here will create arced footers below each section. Before taking on your challenge, you need to create and set up a custom footer that will behave as the placeholder for your future work. To create the class for your shiny new footer, right-click the LearningAgenda folder and select New File. Next, choose Swift File and name the file CustomFooter.swift. Here, you override init(frame:) to set isOpaquetrue. You also set the background color to clear. Note: The isOpaque property should not be used when the view is fully or partially transparent. Otherwise, the results could be unpredictable. You also override init? (coder:) since it’s mandatory, but you don’t provide any implementation since you will not create your custom footer in Interface Builder. 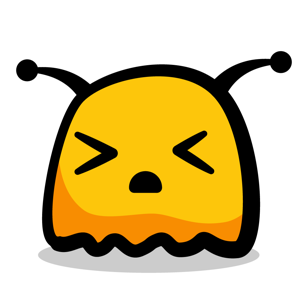 draw(_:) provides a custom rect content using Core Graphics. You set red as the fill color to cover the entire bounds of the footer itself. The above methods combine to form a custom footer of 30 points in height. OK, now that you have a placeholder view in place, it’s time to pretty it up. But first, here’s an idea of what you’re going for. The footer has a neat arc on the bottom. A gradient, from light gray to darker gray, is applied to the footer. A shadow fits the curve of the arc. An arc is a curved line that represents a part of a circle. 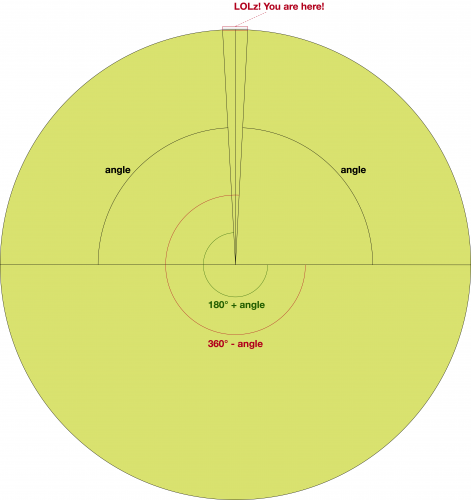 In your case, the arc you want for the bottom of the footer is the top bit of a very large circle, with a very large radius, from a certain start angle to a certain end angle. The starting point of the line to draw, also know as the start angle. The ending point of the line to draw, also known as the end angle. The direction in which the arc is created. But darn it, you don’t know any of that, so what in the world are you supposed to do?! That is where some simple math comes to the rescue. You can actually calculate all of that from what you do know! The second thing you know is an interesting math theorem called the Intersecting Chord Theorem. Basically, this theorem states that, if you draw two intersecting chords in a circle, the product of the line segments of the first chord will be equal to the product of the segments of the second chord. Remember, a chord is a line that connects two points in a circle. 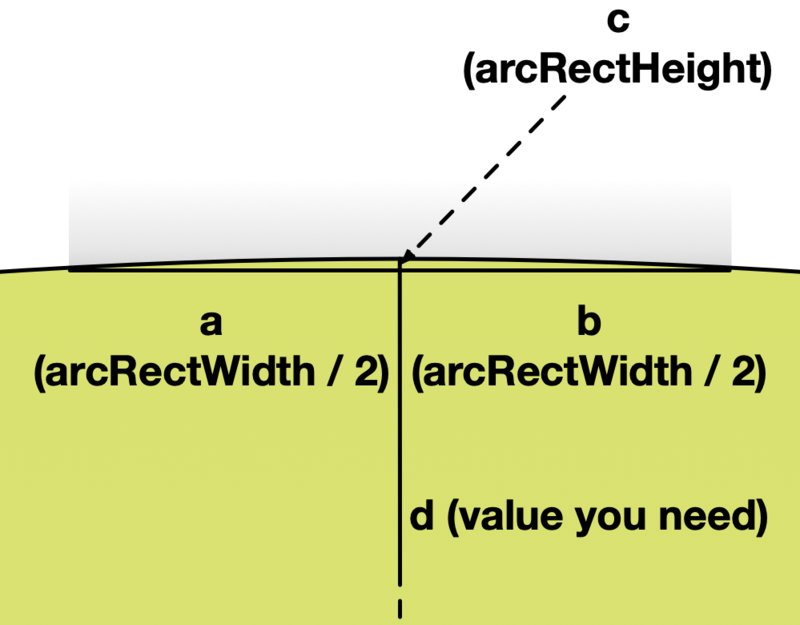 So, draw one line connecting the bottom points of your arc rect and another line from the top of the arc down to the bottom of the circle. If you do that, you know a, b, and c, which lets you figure out d.
You’ll start by figuring out the angle shown in the diagram, here. If you remember SOHCAHTOA, you might recall the cosine of an angle equals the length of the adjacent edge of the triangle divided by the length of the hypotenuse. Nice! Now that you understand how, you can put it all together as a function. Note: By the way, there’s actually an even easier way to draw an arc like this using the addArc(tangent1End:tangent2End:radius:) method available in CGContext type. The first thing you add is a way to convert degrees to radians. To do it, you’ll use the Foundation Units and Measurements APIs introduced by Apple in iOS 10 and macOS 10.12. Note: The Foundation framework provides a robust way to work with and represent physical quantities. Other than angles, it provides several built-in unit types like speed, duration, etc. 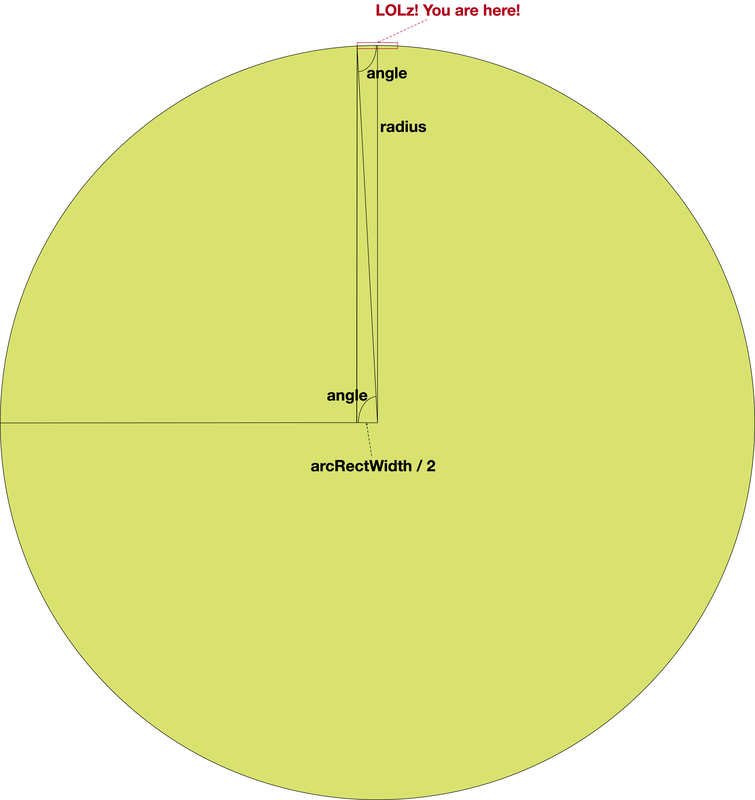 In the code above, you define an extension on the Measurement type restricting its usage to angle units. init(degrees:) only works with angles in terms of degrees. toRadians() allows you to convert degrees to radiants. Note: The conversion from degrees to radians, and vice versa, can also be performed using the formula radians = degrees * π / 180. 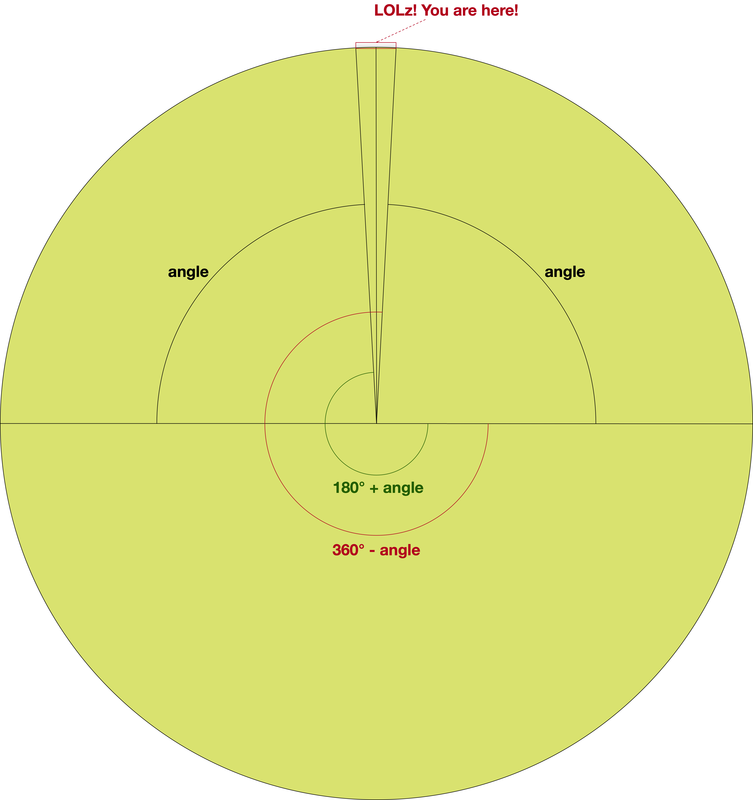 This function takes a rectangle of the entire area and a float of how big the arc should be. Remember, the arc should be at the bottom of the rectangle. You calculate arcRect given those two values. Then, you figure out the radius, center, start and end angles with the math discussed above. Next, you create the path. The path will consist of the arc and the lines around the edges of the rectangle above the arc. Finally, you return immutable copy of the path. You don’t want the path to be modified from outside the function. Note: Unlike the other functions available in CGContext extension, createArcPathFromBottom(of:arcHeight:startAngle:endAngle:) returns a CGPath. This is because the path will be reused many times. More on that later. Now that you have a helper method to draw arcs in place, it’s time to replace your rectangular footer with your new curvy, arced one. After the customary Core Graphics setup, you create a bounding box for the entire footer area and the area where you want the arc to be. Then, you get the arc path by calling createArcPathFromBottom(of:arcHeight:startAngle:endAngle:), the static method you just wrote. You can then add the path to your context and clip to that path. All further drawing will be restricted to that path. Then, you can use drawLinearGradient(rect:startColor:endColor:) found in Extensions.swift to draw a gradient from light gray to darker gray. Looks decent, but you need to polish it up a bit more. OK, there’s a new, and very important, concept going on here. To draw a shadow, you enable shadow drawing, then fill a path. Core Graphics will then fill the path and also draw the appropriate shadow underneath. But you’ve already filled the path with a gradient, so you don’t want to overwrite that area with a color. Well, that sounds like a job for clipping! You can set up clipping so that Core Graphics will only draw in the portion outside the footer area. Then, you can tell it to fill the footer area and draw the shadow. Since its clipped, the footer area fill will be ignored, but the shadow will show through. But you don’t have a path for this — the only path you have is for the footer area, not the outside. You can easily get a path for the outside based on the inside through a neat ability of Core Graphics. You simply add more than one path to the context and then add clipping using a specific rule provided by Core Graphics. When you add more than one path to a context, Core Graphics needs some way to determine which points should and shouldn’t be filled. For example, you could have a donut shape where the outside is filled but the inside is empty, or a donut-hole shape where the inside is filled but the outside is empty. You can specify different algorithms to let Core Graphics know how to handle this. The algorithm you’ll use in this tutorial is EO, or even-odd. In EO, for any given point, Core Graphics will draw a line from that point to the outside of the drawing area. If that line crosses an odd number of points, it will be filled. If it crosses an even number of points, it will not be filled. So, by calling the EO variant, you’re telling Core Graphics that, even though you’ve added two paths to the context, it should treat it as one path following the EO rule. So, the outside part, which is the entire footer rect, should be filled, but the inner part, which is the arc path, should not. You tell Core Graphics to clip to that path and only draw in the outside area. Once you have the clipping area set up, you add the path for the arc, set up the shadow and fill the arc. Of course, since it’s clipped, nothing will actually be filled, but the shadow will still be drawn in the outside area! Congratulations! You’ve created custom table view footers using Core Graphics! You can download the completed version of the project using the Download Materials button at the top or the bottom of this tutorial. By following this tutorial, you’ve learned how to create arcs and paths. 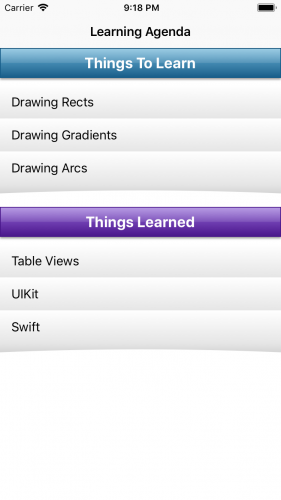 Now you’ll be able to apply these concepts directly to your apps! If you want to learn more about Core Graphics have a look at Quartz 2D Programming Guide.